Why leave having healthy hair up to chance? At Serrão Rejuvenation Center, Dr. John Serrão, a board certified gynecologist and post-graduate trained cosmetic surgeon, offers hair vitamins/supplements for women in Orlando, Winter Park and the surrounding areas of Florida. Jumpstart a healthy hair growth cycle with hair vitamins from within when triggers like stress, aging, hormones, genetics and over-styling take a toll on your hair. We are proud to introduce “hair nutraceuticals.” These are not just simple vitamins. These powerful botanicals act as plant medicines able to target many more causes at the root of compromised hair health than hair nourishment formulations could ever imagine. New technologies exist today to harmlessly extract the most therapeutic and active plant parts, and concentrate them to achieve unprecedented efficacy in addressing many more underlying causes at the root of poor hair health. New research confirms there’s more at play than DNA when it comes to keeping your hair. Combat heredity, stress and other root causes by strengthening and protecting hair where it counts on the inside. Nutrafol is more than just a nutritive, it’s a preventative and restorative supplement that helps return your hair growth cycle to its peak. At its core is the Synergen Complex, a powerful blend of clinically proven extracts that remedy all four stages of unhealthy hair without side effects. 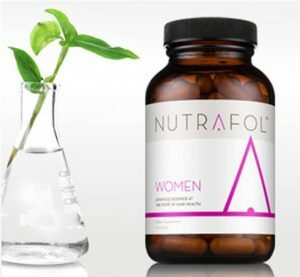 NUTRAFOL is the only super supplement for hair that addresses all four critical stages of hair health to help prevent thinning hair. REBALANCE – Helps rebalance harmful levels of DHT and stress hormones to reduce follicle damage. REPAIR – Supports hair follicle restoration and helps reduce micro-inflammation. REVITALIZE – Helps revive dormant follicles and increases scalp circulation to improve follicle function. Now revitalized, your follicles are empowered to absorb the building blocks of hair again. Once your follicles are properly absorbing essential hair vitamins, minerals and amino acids, they return to their optimal state. This helps support your hair’s growth cycle, enabling you to grow fuller, healthier hair. Having healthy hair takes more than just luck. At Serrão Rejuvenation Center, Dr. John Serrão, a board certified gynecologist and post-graduate trained cosmetic surgeon, offers hair vitamins/supplements for women in Orlando, Winter Park and the surrounding areas of Florida. Contact us to schedule a consultation and begin your rejuvenation today.